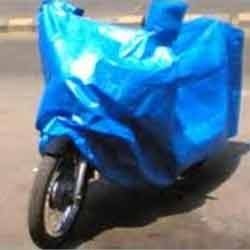 Our vast years of experience and knowledge have made us the leading manufacturer, wholesaler and supplier of Two Wheeler Covers. Offered range is precisely manufactured using high quality approved basic material with advance technology in our high-tech manufacturing unit. The entire range is precisely inspected by our quality personnel to assure quality in compliance with universal quality standards. These products are availed in accordance with the client’s specific requirements through our customization facility. Founded in the year 1992, at Pune (Maharashtra, India), we, “Gaurav Sales”, are considered as the distinguished manufacturer, wholesaler and supplier of a wide range of HDPE Woven Sacks, Packaging Bags, PP Woven Sacks, Packaging Sacks, Tarpaulin Covers, Plastic Tarpaulin Curtains, etc. The offered products are manufactured under the direction of our highly qualified professionals using best grade basic material sourced from the trustworthy vendors of the market. By the help of contemporary machinery and cutting-edge technology, they manufacture entire range in compliance with the set international standards. Owing to the dimensional accuracy, elevated durability, perfect finish and attractive design, colorfastness and reliability, these products are widely demanded in the market. We offer these products to our precious clients in various specifications as per their needs. In addition to this, clients can avail these products from at market leading prices.